Well, it wouldn't be a holiday in Boston if someone couldn't make it to dinner. This time, it was Helen. She was sick, so on Easter morning, Angela & Guillaume stopped by her house in Lexington to pick up her homemade Easter bread, and a dessert. At around 1:00, they arrived at Vas & Sal's house to find Andrew already there. 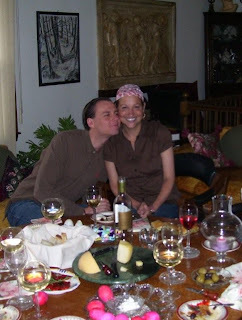 They brought foie gras, baguettes, wines, and walked into a house that smelled delicious! They peeked into the oven to see the lamb cooking. Shortly after, Vas and Sal's British friends, Henry and June, arrived. Then, all the boys took a walk in the woods behind the house. The girls hung out and prepared some food (or had some wine). Guillaume prepared the foie gras and gave Angela the hard task of cutting and toasting the baguettes. Her arm was tired. But the foie gras was a hit. Thank goodness they brought so much back from France! Guillaume and Angela were happy to be together on Easter. There is a Greek tradition with Easter eggs. Everyone chooses an egg, and each person knocks eggs against the person next to them. The goal is to be the "last one standing" with a non-broken-egg, which brings good luck for the year. Andrew won. Andrew ALWAYS wins. Vas and Sal always have a "seasonal" table. This time, of course, decorated for Easter. Isn't it pretty with the pinks and purples? And even though Helen wasn't here, she was in their hearts and on their table... just like Guillaume for Thanksgiving! After hours of eating and chit chatting, Andrew, Angela and Guillaume left, because they all had to work early the next morning. It was a very nice Easter, and Angela and Guillaume were very happy that they were able to spend both Easters with both families. What a treat! Looks very good your Greek Easter ! If I'm right, we have already been in your aunt and uncle's place when we were together ? Gros bisous les mecs ! hihihi !!! we love Easter. I could do that again next week. Please, explain me how you can break eggs on the person next to you without getting her dirty?